Provided under NRS 108.2457(5)(a), this waiver offers the most protection for lien claimants, because it states that if the claimant(s) have actually been paid to date (including no returned or stopped payment checks) the waiver serves as effective proof against any lien claim on the property. The lien is "conditioned" on receiving payment and is only waived if the claimant actually receives the payment. By filing the form, the lien claimant represents that he or she either has already paid or will use the money he or she receives from this progress payment in order to make prompt payment in full all his or her laborers, subcontractors, materialmen and suppliers for all work, materials or equipment that are the subject of this waiver and release. Getting a lien waiver also allows property owners to shield the title to their property from the general contractor, material supplier and every subcontractor involved with a project. By releasing the lien upon a progress payment, the property owner once again has clear title and can obtain financing or sell the property. The property owner should require lien and labor waivers to be submitted with the contractor's invoices and no payment of any invoice should be made unless properly signed lien and labor waivers are provided. 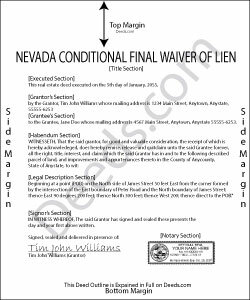 Proper lien waivers can protect the property owner from liens filed by the contractor's subcontractors, suppliers and laborers who might record a lien if they are not paid by the contractor.